Since becoming the Innkeepers of the White Oak Manor bed and breakfast we have been enjoying all the wonderful events that Jefferson TX has to offer. 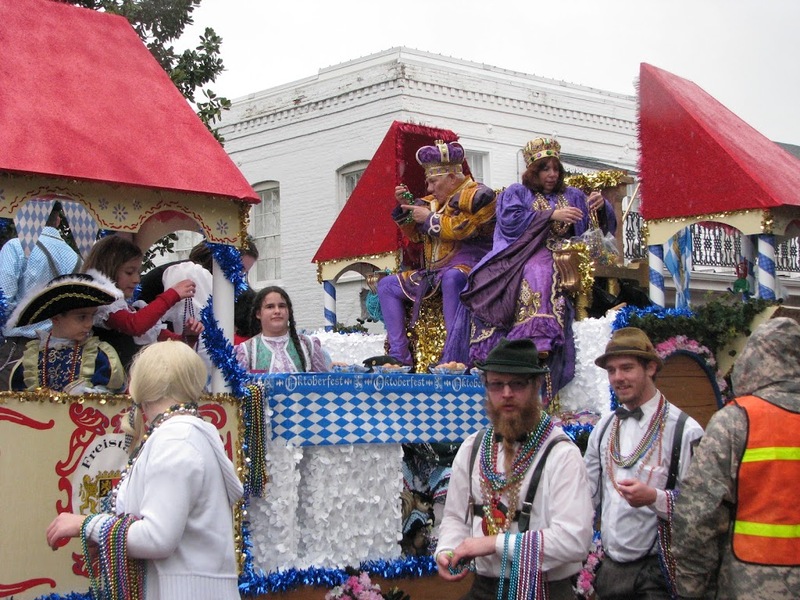 Last weekend David and I experienced our first Mardi Gras Upriver celebration in Jefferson Texas. We arrived downtown Friday night in time for the Doo Dah Parade. This particular parade was filled with decorated golf carts, 4 wheelers and people walking. Everyone is invited to join this parade, so get dressed up in your favorite craziest costume and jump right in. The parade starts at Lion’s Park and winds around to the main stage where the bands are set and ready to play the evening away. On Saturday the Main Mardi Gras parade winds its way around the downtown streets giving everyone plenty of chances to pluck some beads out of the air. The floats were all beautiful and varied in styles that fit with this year’s theme of “Festivals Around the World”. This year marked the 23rd anniversary of the Krewe of Hebe’s presenting the Mardi Gras Upriver celebration. 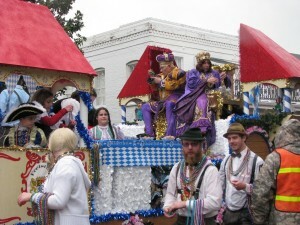 Next year promises to be another awesome weekend filled with bands, carnival rides, dressing up in purple-gold-green, putting on a fun hat and dancing your cares away. Hope to see you here the weekend of February 8-9, 2013. We will be sure to post next years theme as soon as we know. 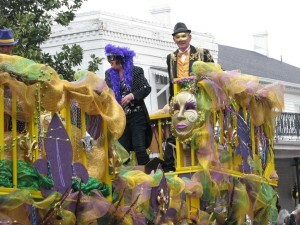 This entry was posted in Mardi Gras Upriver, Special Events by Tammy D. Bookmark the permalink.